We are starting the second week of BM#55 with a tour around French Cuisine. I didn’t have enough time to read through all the courses, so I was looking out for specific course of meal and decided it was best to start with a sandwich. I have quite an affinity towards French, it was my second language for four years, starting with school and continued in college. However the only words I seem to remember right now is Bonjour and Mademoiselle. Of Dame, from le dame sans merci, which seem to have struck in memory forever! Would you believe if I say I rather wanted to write pages and pages on my memories associated with French and finally as it seem to happen offlate with me, I ended up working on this post the night before? Well you got to believe! Life has suddenly become very hectic. Athamma has left for her daughter’s place and everything has been even more tightly wraped to manage! Anyway with all things apart, I didn’t want to delay writing this post and with a moment’s free, which has become quite rare, I sat down to cook myself this sandwich and write about it right away! Trust me, the steps are so simple that I felt it was not worth bothering to do a step by step. 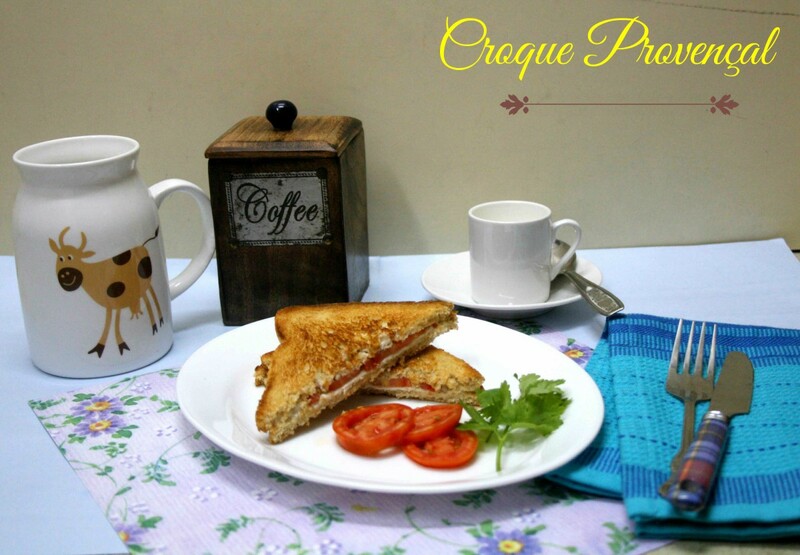 The sandwich for the day is based on Croque-Monsieur. Its a grilled ham and cheese sandwich, topped with bechamel. It was popular in French cafes and bars as a quick snack. The cheese typically used is Gruyère, however I used processed cheese slices. As with any recipe, there are many variations to this. I decided to make croque provençal or with tomato. 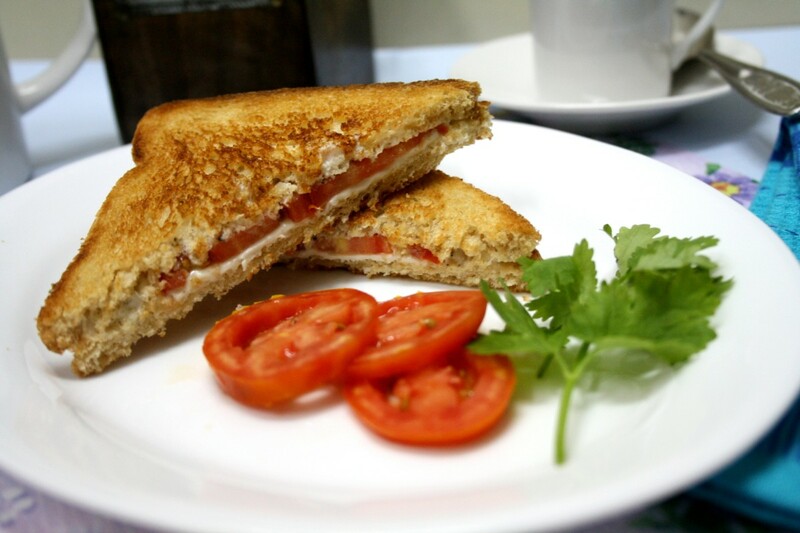 This sandwich is made with toasted bread, cheese, sour cream and tomato slices. Its grilled till crispy. Additionally one can add eggs as well. I kept to sour cream/mayo, tomatoes and cheese. Spread the bread mayo/ sour cream. Put slice of cheese on one piece of bread. Add tomato slices. Sprinkle with salt, pepper. Cover tomato slices with other slice of cheese, then cover with other piece of bread. Heat pan with butter, spread butter on top of each side of bread. Grill until sandwich is brown on both sides and cheese is melted. The sandwich looks interesting , like the combo used, it can never fail! And for sure would have loved to read that long post , but yes sometimes life is hectic???? I can imagine life getting hectic without athamma. The tiny little moments of peace are going to get rarer and rarer! I am glad you still got a post done despite so much happening in the background! What a easy breakfast recipe.. Sure it must have tasted great. 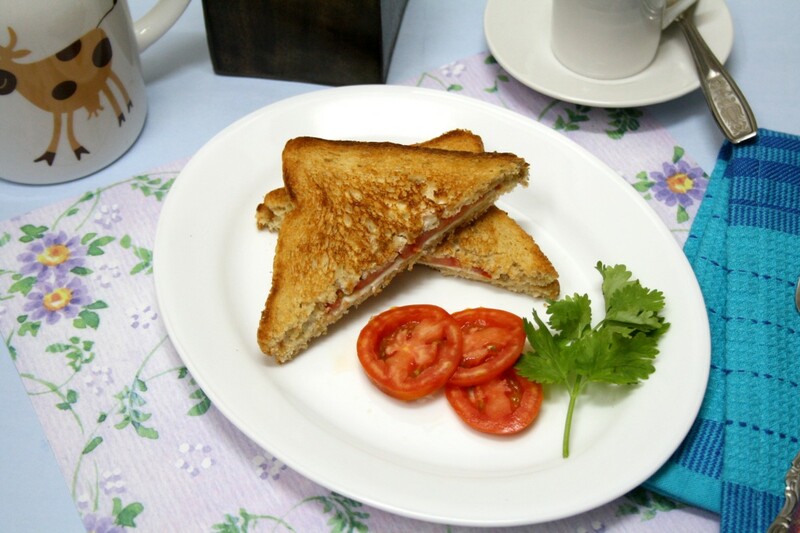 Sandwich looks simple and delicious. Cheese snadwich is the favorite one.Nicely done.